The week got off to a good start for BlackBerry users Monday as the company announced they'll finally be able to chat with each other for free with the latest update to BlackBerry Messenger. Teased last month in the BBM 7 beta, the new feature allows users to strike up a conversation with any of their BlackBerry Messenger contacts, provided they're connected to a Wi-Fi signal. Additionally, the new voice chat feature still allows users to talk via text while chatting, which lets users enclose pictures or private statements they don't want heard aloud. 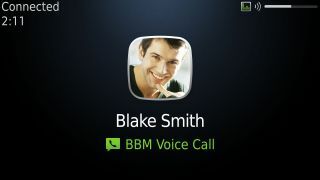 BBM 7 will also include the ability to voice chat while using other aspects of the phone, such as checking emails or reading other text messages. This latest update for BlackBerry Messenger will only be compatible with smartphones running BlackBerry OS 6 for the time being. RIM is planning to add support for BlackBerry OS 5 next year, and is also expected to include the feature in BlackBerry 10 when it finally arrives. The good news is anyone currently using a device with BlackBerry OS 6 that upgrades to a BB10 smartphone won't have much difficulty transferring contacts. An additional feature of BBM 7 is the welcome ability to link all contacts and groups to a specific BlackBerry ID, where it can be accessed on whatever device that ID logs into. There are also 17 new emoticons being added with this update (insert smiley face), as well as better upgrade notifications which will be delivered straight from the app itself. The BBM 7 update started rolling out, and should be available to everyone within the next 24 hours.